The world's first camel-milk chocolate was launched in Dubai today. The announcement of the chocolate, called Al Nassma - after the arabic word for a cool desert breeze - is a tremendous development for the UAE's camel milk industry as demand from the chocolate manufacturers will create a need for more camel milk. 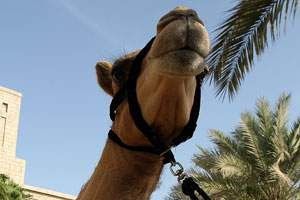 Although a traditional staple for the Bedouin, camel milk is not produced on a large scale. There are currently two camel farms in the country and fresh camel milk is still very much a niche product. The Al Nassma chocolate is produced from camel milk powder made from Dubai-based Camelicious, the brand's sole camel milk provider. At the moment, the UAE is not allowed to export dairy, meat and other animal products into the European Union because the country, like many others in the region, has not been declared free of foot-and-mouth disease. This may soon change as studies carried at Dubai's Central Veterinary Research Laboratory (CVRL) have proven that one-humped camels, the variety native to the UAE, are resistant to the disease. An Austrian company, HM Chocolate Holding, has a 50 per cent ownership in Al Nassma, which means that the UAE camel milk industry now has a powerful ally to aid its efforts to bring camel milk products to European markets. Although camel milk is produced in many countries in the Middle East and North Africa, only Dubai has a facility which enables chocolate makers to produce a quality product, said Martin van Almsick, general manager of Al Nassma and former manager of the famous Cologne Chocolate Museum. Mr Van Almsick's words were confirmed by Vienna-based Johann Georg Hochleitner, member of the company's board of directors, whose idea it was to create camel milk chocolate. Mr Hochleitner, who has already created chocolate made out of sheep and goat milk, spent two years, travelling as far as Libya and Kazakhstan, to look for a suitable camel milk producer. After finding Dubai's Camelicious, it took another two years to develop the product line. "We want to create a brand which has international importance," said Mr Hochleitner. "I believe this product has the power to become the sweet ambassador of Arabia born in Dubai"
"We have only the best ingredients," he said, explaining that the company does not use artificial flavours. The honey, used in some of the flavours comes from Yemen, while the vanilla is from Madagascar.